Want a beautiful, flowering vine for a sunny spot in your yard or garden? Want it to return and bloom year after year? Well, you want a clematis! It’s a deciduous perennial vine that you can grow on a fence, trellis or mailbox post as long as your chosen spot gets at least six hours of full sun a day. 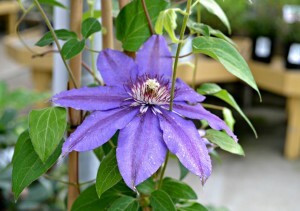 You can even grow a clematis vine up a tree or hedge, to add some flowering interest to the foliage. The clematis loves the heat of the sun, but its roots do not. This situation is easily resolved by planting a ground cover or low-growing annual at its base to provide cooling shade. A layer of mulch can do the same thing; just make sure that you leave the area around the stem clear. 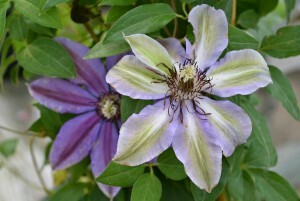 To achieve optimum blooming each year, many clematis require pruning to a certain degree. When you purchase your vine, it should have an information tag which tells you which pruning group it belongs to: Group 1, 2 or 3. Group 1 plants flower on old wood and need very little pruning if any. Group 2 plants flower twice a season and need a light clean-up after the first bloom. Group 3 plants flower on the new growth of the current year, usually after early summer; these should be pruned in late winter or early spring. 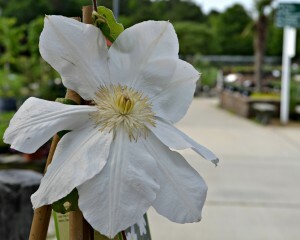 There are countless varieties of clematis which bloom in countless colors and color combinations. Their flowers vary in size from 1-2 inches, up to 6-8 inches! There is even a multi-colored variety with a delicate fragrance known as ‘Sweet Summer Love’. Some bloom in the spring, like ‘Nelly Moser’. Others bloom all summer, like the aforementioned ‘Sweet Summer Love’. 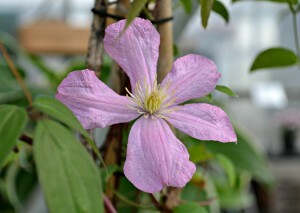 There are even clematis which bloom twice, late spring and early fall, like ‘Vancouver Starry Nights’. Impress your friends! Impress your family! Impress yourself! Grow a clematis or two (or more) and enjoy the gorgeous blooms season after season.